Travel and books are two of my most favourite things in the world. On rare occasions when these two combine, it is often difficult to fathom the extent of my happiness. Reading a book on a beach or reading a book about the beach brings me almost the same kind of joy. It is hence quite discernable that one of my favourite genres to read is travelogues/travel memoirs. I had the happy chance to read a unique travelogue this week. It Was a Happy Trusting World, Then is a book that will satiate the traveller and the reader in you equally. Read on to know more about my thoughts on this book. 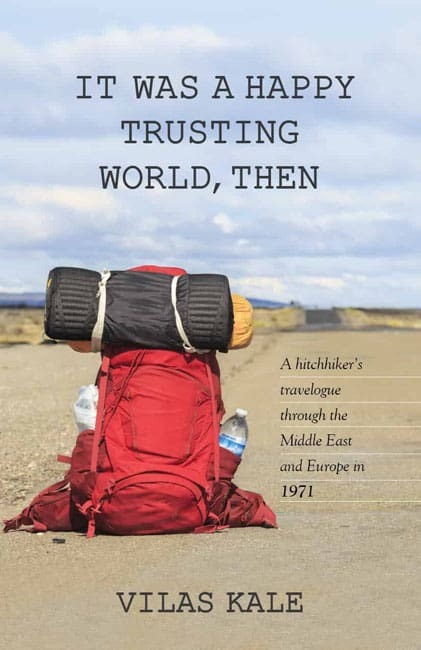 It Was a Happy Trusting World, Then is a book by Vilas Kale which talks about a hitchhiking trip that he took, along with his two cousins, in the year 1971 to the Middle East and Europe. Planned on an impulse and carried out despite extreme budgetary limitations, the trip proved to be a once-in-a-lifetime experience for this Indian trio. What makes this book strikingly different from other travelogues that I’ve read is the fact that the trip happened almost 50 years ago. Reading the book feels like reading oral histories of people of the Middle East and Europe. Everything about the book screams vintage and if you happen to be an admirer of all things old, you are certainly in for a treat. You would be happy to read about the very European-like vibes which the trio perceived while travelling throughout the Middle East. Places like Damascus, Aleppo and other conflict-torn cities that now lie in shambles were once quite popular destinations. Reading about the cold war era communist countries is also a one-of-a-kind experience for the reader. The sheer contrast between the propaganda and the actual realities in the then communist countries of Bulgaria, Hungary, and Romania also make for an eye-opening read. The most charming aspect of It Was a Happy Trusting World, Then is that the trip which the author so passionately writes about was done almost impromptu and on a shoestring budget. The trio was often left at the mercy of unhelpful car drivers and unwelcoming people who refused to give them lifts. In order to save money, some nights they also had to sleep on empty stomachs. Even though such cases were far and few and the love that they received far exceeded the indifference of a few strangers, the trip was a learning curve for all of them. What I liked about Vilas Kale’s writing is that he is very precise when it comes to facts and figures. Since he noted most of his experiences in his personal diary, he very easily recollects the amount of money he paid for a Turkish Visa or the price of a flight ticket from India to Kuwait. This helps a lot in contrasting the old with the new. It helps put things in perspective as the change between then and now can easily be ascertained in quantitative terms. A travelogue or just a diary? One thing that I found lacking in the book was stories. The book read more like a diary than a travelogue or a travel memoir. Personally, for me, what constitutes a good travelogue is the stories that one comes across while on such trips. The author has written the book in a very chronological and mechanical format forgetting to pay attention to the stories/tales that one seeks while reading such books. It Was a Happy Trusting World, Then is a book that tells, in very few words (just over 100 pages), the spur-of-the-moment adventures of 3 cousins who went on a hitchhiking trip to the Middle East and Europe. Despite some obvious shortcoming in the writing style, the book makes for an entertaining and informative read especially for those who frequently find themselves bitten by the wanderlust bug. If you enjoy books on and about travels. If you want to enjoy a short and easy travel memoir about hitchhiking. You don’t want to read a travelogue about a trip that happened almost 50 years ago. Can’t wait to read it? Buy your copy of It Was a Happy Trusting World, Then from the link below.